This guide by [Janitor] outlines the steps required to fit HID headlights to an S2. There are different versions of the kit, but the principles remain pretty much the same. Unplug, unclip and remove the existing dipped headlight bulb and install the HID bulb. I chose to do this first of all so that it’s safely stowed and kept clean whilst you’re sorting the cabling. Due to the lack of easy access, placing the HID tube into the holder is difficult, but be patient and avoid touching the bulb itself with fingers. (It can be cleaned with alcohol & lint-free cloth if accidental contact is made). Next up, poke through the rubber grommet from inside (1) and trim the inner edge a little (2) to free things up a little for when it comes to pushing the HID bulb cable connectors through. Take much care here – don’t cut the cables or yourself and remember that your precious paintwork is barely a couple of inches away! Thread all the appropriate connectors through the grommet (1) and refitting the grommet is best done by poking the whole thing through the hole in the clam and manipulating back into place from the inside of the arch. Attach the HID unit feeds to the original headlight bulb connectors (2) and tape them up for insulation and a little extra mechanical fastening (3). Tuck excess cable neatly away under the cable entry point away from the bulb housing and the hole for the glass fixing bolt (4). 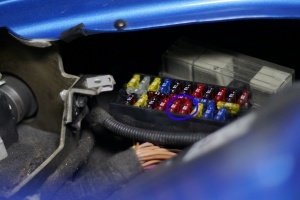 (Note that the grommet supplied on the replacement HID bulb cables is not needed in this case. Either remove or carefully slide it up to the existing entry grommet as an extra drip-break). Take this opportunity to connect the HID feeds or ‘ballasts’ and run a quick power-up test – there is really only one way this kit can go together (unless you’re trying really hard!) and it beats stripping everything apart again afterwards should something not be quite right! Being unsure exactly what is what under there, I found it tricky to locate a safe & secure place into which I felt confident of tapping screws for mounting the ballasts. There are twin oil-coolers on the SportsRacer and not knowing what was behind any other panels, I elected to utilise the supplied bracket and then a ‘known’ fixing. One 10mm socket later and all was firmly attached to one of the light unit mount bolts (not the glass securing bolts!). This is ideal as it is away from all other components and pipes etc whilst not interfering when arch liner is refitted. Replacing the sidelight bulbs is dead simple. The holder is fixed into the top side of the main beam light housing and you simply turn the sidelight bulb holder through 90 degrees, substitute the standard bulb with a direct LED replacement and refit. The headlight fuse needs upgrading from 10A to 15A. Although the HIDs actually draw less power, they have a high power draw on startup. Fusebox under passenger side bonnet panel. TUTORIAL: Fitting of £60 HID kit by steve1978. Kit consists of: 2 ballasts 2 Bulbs all connections nuts and bolts cable ties. Other kit required. trolley jack flat head screw driver cross head screw driver electricians tape. Time taken approx 30 mins per light. Step 4: On the top of the liner there is a void. this is where the ballast will be fitted (between the body and the lining), if you look through the bonnet vent you may just be able to see the location of the ballast. Step 5: Remove the existing light bulb and insert your new one, you may find it easier to remove the lighting unit, we did (3 cross headed screws on the inside of the arch). feed the cables through the hole and connect them up. there is only one possible way to connect them. Step 7 Stand back and be proud! This page was last modified on 13 February 2015, at 19:38.